Found 3 file extension associations related to The Longest Journey and 3 file formats developed specifically for use with The Longest Journey. 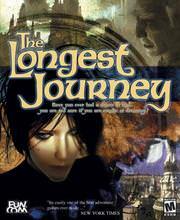 "The Longest Journey" is an amazing graphical adventure, where the player controls the protagonist, April Ryan, on her journey through more than 160 locations, spanning two original worlds, and featuring a cast of more than 50 speaking characters. "The Longest Journey" will take you on an exciting and original journey of discovery, where you will explore, solve puzzles, meet new people, face terrifying monsters, learn, grow, and live the adventure of a lifetime! If you need more information please contact the developers of The Longest Journey (Funcom), or check out their product website.